Last week I attended Today’s Dietitian Spring Symposium in Las Vegas with friends. They were picking me up on their way through town and stopped in for dinner. It was a great opportunity to clean out the fridge and use all the vegetables that my husband probably wouldn’t eat while I was gone. The intention of reducing food waste produced something really great and I need to document it because I can’t wait to make it again! I would also love to share it with you. Each week I like to roast a variety of vegetables to add to egg scrambles for breakfast or to mix with lentils and potatoes for lunch (which means I also bake potatoes each week), among other things. The variety this week was purple cabbage, zucchini and yellow squash (just chopping, tossing with a bit of olive oil, salt and pepper and roasting at 400 degrees for 30 minutes or so) and I was able to use the remaining before leaving town. You can do whatever vegetables you like, even just sautéing, grilling or using frozen in it’s place. However, I would recommend making a habit of having deliciously roasted vegetables on hand to use in your meals! A little bit of prep work ahead of time makes meal assembly during the week a breeze. ¾ cup pesto sauce I used this brand and it was yummy! Cook pasta using package directions. Place colander in the sink and put your chopped kale in it. As you pour your cooked pasta over the kale, it will wilt perfectly. 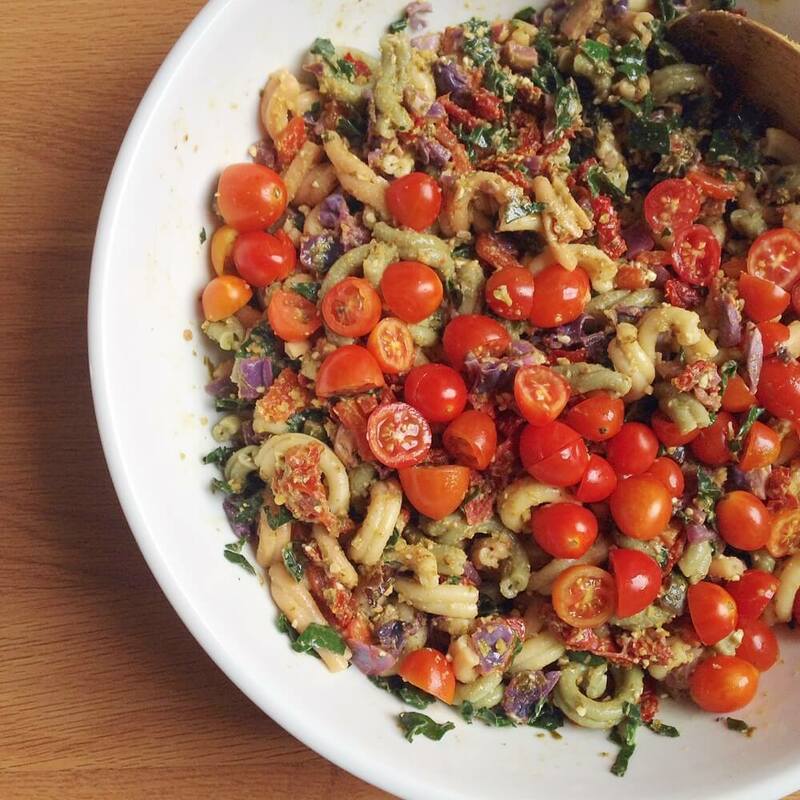 As you wait for your pasta to cook, combine pesto sauce, lemon juice, sundried tomatoes, roasted red pepper, roasted vegetables (may want to reheat them prior to adding), walnuts and nutritional yeast (if using) in a bowl. Add drained pasta and kale to the bowl and toss to combine. Top with grape tomatoes and serve warm. I heart pasta. It’s both physically and psychologically satisfying. It’s also a great opportunity to add so many flavorful and nutrient dense foods to make an easy side dish or one pot meal. I hope you enjoy! *Nutritional yeast has a nutty, cheesy flavor. I added it because it was mixed with the chopped walnuts in my fridge as a coating I had used the week before for roasted vegetables. As you know, I was all about cleaning out the refrigerator. You could replace with some parmesan or just omit and it wouldn’t change the flavor much.